The Premise: The storage array is dead, dead as a doornail. The monolithic storage array used to be the standard of storage, but it’s time has come and gone… or has it? The roundtable discusses what specifically we mean when we talk about storage arrays, why they are increasingly irrelevant, and if their decline is permanent, or a temporary reaction to recent IT trends. SUBSCRIBE to our newsletter for more great coverage right in your inbox. Rich has been a tech enthusiast since he first used the speech simulator on a Magnavox Odyssey². Current areas of interest include ZFS, the false hopes of memristors, and the oral history of Transmeta. 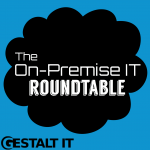 Subscribe to the On-Premise IT Roundtable Podcast on iTunes, Google, Stitcher, and more! Visit the Gestalt IT YouTube page to watch Roundtable videos!